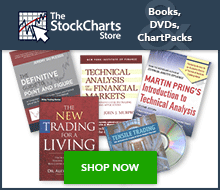 StockCharts.com provides end-of-day (EOD) data for an array of futures contracts traded through the CME Group. The CME, CBOE, COMEX, KBCT and NYMEX are all part of the CME Group now. These futures contracts cover precious metals, oil, the e-mini and more. Spot prices are also available for select commodities traded through the CME. Users will see the words “spot price” in the name for these symbols. Spot prices can be used to create long-term charts for a specific commodity. Keep in mind that some futures contracts trade almost round the clock. For example, the E-mini S&P 500 contract trades 23 hours per day and five days per week (Monday through Friday). This makes the “opening” price almost irrelevant because there is no “overnight” period. The symbols for these futures contracts consist of several parts. The first character is a caret (^), which is reserved for futures contracts. The next character or characters represent the name of the futures contract. For example, the “HO” in the symbol ^HOM13 stands for heating oil and the “S” in ^SH14 stands for soybeans. The next three characters represent the month and the year of the contract. The last two numbers identify the year, while the letter identifies the month. ^SH14 is the symbol for the March 2014 Soybean contract. Below is a list of the corresponding months and letters. Users can find symbols for CME futures contracts by searching for “cme” in the symbol catalog (without quotations).